The Battle of Allatoona Pass was the first engagement of John Bell Hood’s Franklin and Nashville Campaign. Fought in the mountains northwest of Atlanta, it took place even before Sherman started his infamous March to the Sea. The site is now Allatoona Pass Battlefield near Cartersville, Georgia. Trails, monuments, and interpretive signs help visitors understand the tactics of the battle and the significance of the battlefield’s well-preserved Civil War fortifications. The Battle of Allatoona Pass began on September 2, 1864, when the Union army of General William Tecumseh Sherman finally took Atlanta. The transportation center fell after months of hard fighting between Sherman’s men and the Confederate Army of Tennessee, led first by Gen. Joseph E. Johnston and later by Gen. John Bell Hood. Sherman noticed Allatoona Pass as he fought his way through the mountains to Atlanta, recognizing it as a choke point where the trains of the Western & Atlantic railroad passed through a “cut” excavated 175 feet down through solid rock. If the Confederates gained control of the pass, they would stop the flow of supplies to Sherman’s army as it made its final drive for Atlanta. The high ridges on either side of the pass were naturally advantageous to its defense and Sherman sent Capt. Orlando M. Poe to design and build fortifications to protect the cut and the vital supply depot in the community at its southern entrance. Poe was the chief engineer for Sherman’s army and quickly developed a plan for the defenses ordered by his commander. Poe supervised the building of two primary fortifications at Allatoona Pass. The East Redoubt and the Star Fort stood on the hilltops east and west of the pass. Artillery aimed out from these strong earthwork positions and infantry trenches were dug to connect them. Trees were cut from the slopes of the ridge, opening a broad field of fire and leaving entangled limbs and branches that would break up any enemy attacks up the hillsides. The decision to fortify the pass proved to be prophetic. Confederate President Jefferson Davis met with Gen. Hood after the fall of Atlanta and approved a plan for the army to take a strong position on the Western & Atlantic between Chattanooga and Atlanta. The move would break Sherman’s line of supplies and, they believed, force him to come out of Atlanta and fight on ground much more advantageous to the Confederate army. That Sherman had already driven the Southern army out of these same hills was not a consideration, probably because this time it would be between him and his supplies. The plan might have worked. The Union general was not yet fully committed to his “March to the Sea” and worried about just such an effort by Hood. Unfortunately for the Confederates, Hood changed the plan that Davis approved and instead sent only the 3,276 man division of Gen.Samuel G. French to take Allatoona Pass. He was told to destroy the bridge over the Etowah River and then reunite with the main army at New Hope Church. The expedition required French to march his division 96 miles in two days. Since infantry forces of the time usually covered around 15 miles per day, the orders from Hood were unrealistic at best. Covering that distance through mountain terrain in two days was virtually impossible, especially with Union troops and cannon waiting to fight for control of the Allatoona Pass defenses. French nevertheless deployed north from Big Shanty near Marietta to begin his expedition. The Union observation post atop Kennesaw Mountain spotted the Confederate movement and telegraphed Sherman's headquarters. Reinforcements started for Allatoona Pass, the apparent objective of the Confederate effort. 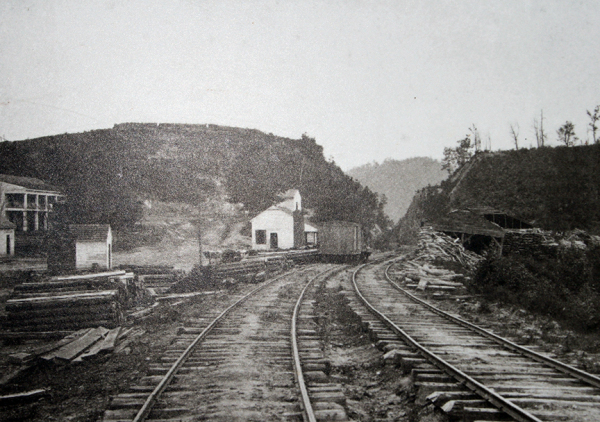 Allatoona Pass as photographed in 1864-1865 by George N. Barnard. Preparing the best he could, the general sent part of his division to the left with orders to attack Union positions east of the Deep Cut. The rest of the Confederates prepared to storm the Star Fort on the west ridge. The 35th and 39th Mississippi Infantry regiments tried to storm Union trenches between the Eastern Redoubt and a footbridge over the Deep Cut. Waiting for them were the 4th Minnesota and 12th Illinois. The Confederates rushed across open ground and up the steep ridge, blasted the entire time by Federal musket and cannon fire. The attack deteriorated into a bloody disaster. The Mississippians fought bravely but failed. Col. R.J. Durr of the 39th Mississippi and a number of his men were pinned down in a gully and taken prisoner. The rest of the Confederates, meanwhile, tried to storm the heavily defended Star Fort on the opposite side of the Deep Cut. French decided to send three attacking columns against the strong earthwork from three directions at once. The Federals, however, has built a position called Rowett’s Redoubt 200 yards down the ridge from the main fort. Col. Richard Rowett held the redoubt with the 39th Iowa, 7th Illinois and five companies of the 93rd Illinois. A 12-pound field gun gave added firepower, and many of the Union soldiers held repeating rifles. Brig. Gen. Francis M. Cockrell’s Missouri Brigade and Brig. Gen. William H. Young’s Texas and North Carolina Brigade stored Rowett’s Redoubt at 10:20 a.m. The fighting was hand to hand with the men of both sides using musket butts, rocks and even their fists as weapons. Cockrell and Young took the position, driving the survivors of Rowett’s command back to the Star Fort, but suffered heavy casualties in the process. The Confederate line now pushed forward to the Star Fort, taking heavy fire from the men there as well as those of the 12th Illinois firing from the other side of the cut. As French planned, his men attacked from three sides at once, pouring so much fire into the Union earthwork that 192 bullets perforated the U.S. flag. Still, the Union lines held. French threw his men against the earthworks four times, but each time they were driven back by a hail of musket and cannon fire. The strong earthworks, artillery, repeating rifles and high ground of the Union position proved too much for the Confederates. When he learned that additional Federal reinforcements were approaching, Gen. French called an end to the battle and by 3:30 p.m. was on the march to reunite with Hood’s main army. He lost nearly one-third of his men in the disastrous attack. The Confederates lost 897 men, including the 80 Mississippians captured in the gully near the Eastern Redoubt. The Federals lost 706 men, roughly 200 as prisoners of war. It took nearly three weeks to find and bury all of the bodies. Allatoona Pass Battlefield is on the western shore of Lake Allatoona in Bartow County, Georgia. 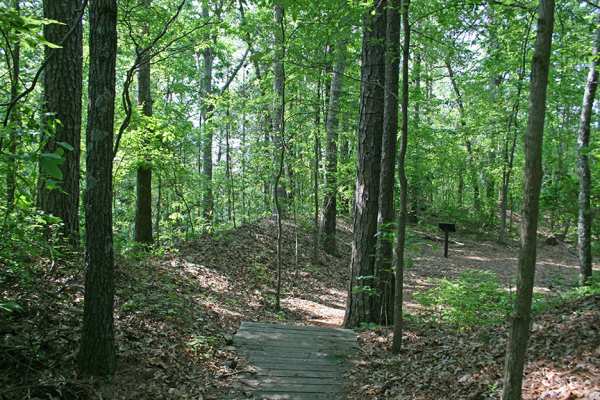 Developed through the work of the Etowah Valley Historical Society, the park features trails, monuments, interpretive signs, the “Deep Cut” and the well-preserved earthworks of both the Eastern Redoubt and Star Fort. The infantry trenches that connected the main forts are remarkably intact and line the walking trails that lead through the site. Staff from Red Top Mountain State Park maintains the heavily-wooded battlefield. Interpretive trails lead along a mountain ridge and can be strenuous. Be sure to carry water in the summer months as no drinking water is available on the battlefield. To reach Allatoona Pass Battlefield from I-75 north of Atlanta, take Exit 283 (Emerson-Allatoona Rd.) and follow it east for 1.5 miles to the battlefield, which will be on your left. Free parking is available, and there is no charge to walk the well-marked trail. See the map below for directions. 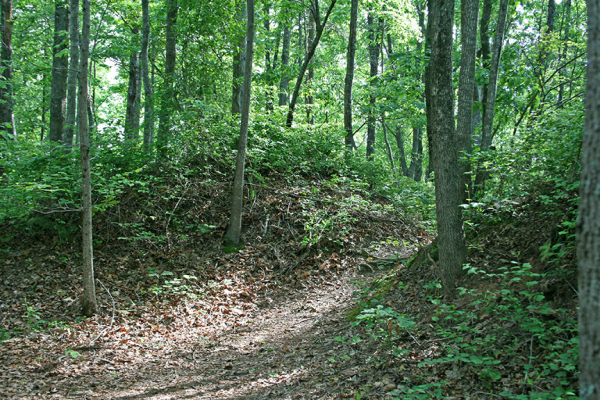 The well-preserved earthworks of the Eastern Redoubt at Allatoona Pass. The Star Fort was the scene of heavy fighting as Confederate troops tried to storm the hilltop citadel but were driven back by Union soldiers. 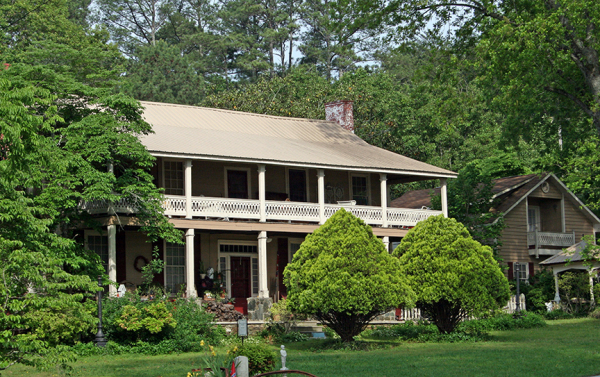 The Clayton House, now a private residence, stood witness to the brutal fighting. It is visible at the far left of the Civil War era photo above. By thy grace we will." "Hold the Fort" is sung in Christian churches around the world to this day. Fulfilling Sherman’s promise, Union Brig. Gen. John M. Corse reached Allatoona Pass at 1 a.m. on October 5, 1864. He brought with him 1,000 reinforcements and quickly assigned them positions in the earthworks and trenches atop the ridge. The first Confederates arrived two hours later at 3 a.m.